As a business, you will likely deal with data and documents on a regular basis. With cloud technology, sharing documents has become easier and riskier. Some of these documents may be for internal purposes, while others may be for clients. Regardless, you need to ensure you have better control over these documents, enhance document security, maintain records of the users of the documents, and so on. The reason for such requirements is that enterprises cannot afford any of their data being copied or accessed in an unauthorized manner. With the latest news of data breaches coming frequently, it has become imperative to think of data security in a more organized manner. What’s the solution? Digital Rights Management software. DRM software with document encryption and copy protection are most sought after technologies in document security. Doing a comprehensive research before choosing a DRM software is important. So, make sure you ask these seven questions when choosing a PDF DRM software for the protection and security of your documents to ensure you choose the right one. 1. Does the PDF DRM Provider Offer Me a Unique Username and Password? 2. Can I Control and Restrict Access to My PDF Documents? 3. Does the PDF DRM Provider Enable Me to Make Changes to the Access Rights? 4. Is the PDF DRM Provider Capable of Stopping Screen Grabbing and Printing? 5. Can the PDF DRM Security Software Restrict the Implementation of the License to One PC? 6. How Sound Is the PDF DRM Provider Regarding the Security of My Computer? 7. How Sound is the PDF DRM Supplier in Terms of Content Security? It is imperative for you to identify and track down each action taken on your documents. Through a unique username and password, you will be able to distinguish between the users of the document and have close control over the usage and changes made to your documents. Your PDF DRM software should be able to provide you with complete control by allowing you to determine how your documents are accessed or used and by whom. You should also be able to control and restrict the access of your PDF documents to a certain IP address or IP addresses, regardless of the country in which they occur. For instance, a certain document may only be seen in the USA; however, your software should enable you to make it available to someone outside the USA as well. Your PDF DRM protection software should give you the right to change the access rights to your documents. Using this protection tool, it should be possible for you to prohibit any specific sub-administrator from accessing a document. The same tool should also empower you to look at the changes made by every user on each document. There are many PDF DRM software providers who can only prevent the Windows print screen. So, you must ensure that the PDF DRM protection software you choose is capable of preventing screen grabbing. Your PDF DRM solution should also be able to identify a real printer compared to a fake one. There are a number of print drivers that can convert a printout to a file, thus breaching the security of your documents. A single license implementation can be replicated across various PCs in servers like Citrix and Windows Terminal Server. This can harm your sales as you want each license to provide unique access to that particular user or PC. An appropriate PDF DRM security tool should be able to restrict the implementation of any license to just one PC and prevent any unauthorized duplication. Does the PDF DRM protection software force you to use unsafe methods that expose your computer to risks? Most companies have no content security experience. Make sure the company with which you deal demonstrates security credentials. This will enable you to protect your content and you will be sure that the security software you have is not the affiliated one that is re-branded by the company as their own. 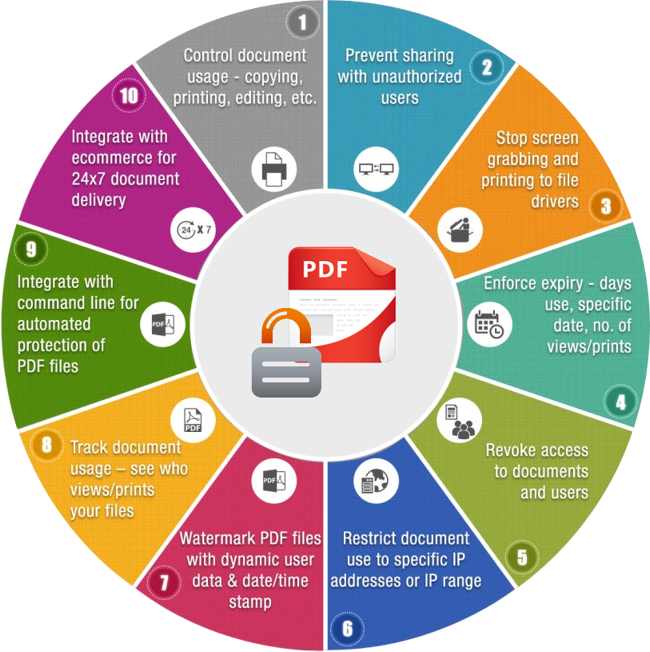 Feel free to share your feedback or inputs on the above list of questions you need to ask when selecting your PDF DRM protection software. Note: This article was published in association with Locklizard, a document security specialist. They provide advanced solutions for PDF security capable of preventing screen grabbing to prevent intellectual property theft. Visit website for more information.